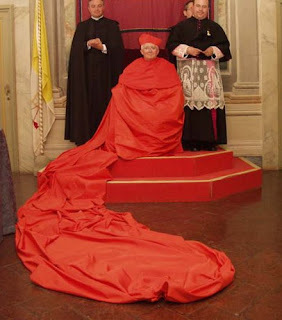 It might still be Advent... but to the joy of traditionalists everywhere, the new Worship Czar's already come all wrapped up for Christmas. It's worth noting that, unlike his now-predecessor at Culto Divino (a lead Curial opponent of what became Summorum Pontificum), Antonio Cañizares is already a member of Ecclesia Dei -- the Roman body that serves as Divine Worship's equivalent for the communities using the 1962 Missal. But in a sea-change of greater import, with a non English-speaker now at the helm of the dicastery that oversees the approval of liturgical texts, this morning's appointment ostensibly strengthens the hand of Vox Clara and the rest of the team leading the decade-long re-translation of the Roman Missal; of course, born in Nigeria, Cardinal Francis Arinze brought a native Anglophone's take to the deliberations, along with a vested interest in the result. Keep in mind that, while CDW has granted recognitio to the first pillar of the new rendering of the Mass, eleven more parts remain to be approved -- all told, the process is slated to wrap sometime around late 2010. As announced at its latest gathering last week, the A-list advisory body on English translations isn't slated to meet again until August, an unusually long gap seemingly crafted to give the new prefect time to get up to speed. For Our Patroness, an Immaculate "Word"